UpKeep is the #1 Asset and Equipment Management Software for Facility management teams. Create work orders on-the-go, get notifications when tasks are updated, and receive alerts straight from your phone when assets go down. By closely monitoring your maintenance, UpKeep helps reduce downtime and allows you to view detailed reports for better insight. All data is backed up daily and securely stored in the cloud. This means you can access your business information from any device, anywhere. 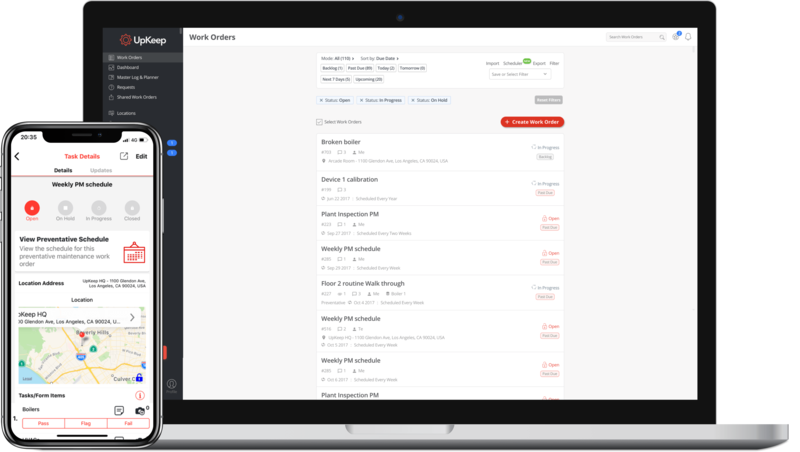 Manage the status of work orders and requests right through the app. Keep track of all current and upcoming work orders in a single glance. All the info in one easy layout. “It was really user friendly. ~ Nathan Gribbons, Maintenance Lead Tech at Stericycle Inc.